To use the CALL or EXEC command, you must open the calling procedure in the Procedure Editor and enter the command inside of a function (CASE/ENDCASE command). You can type the command directly or use the Language Wizard. Specifies the WebFOCUS Server where the procedure resides. For more information, see Executing a Procedure on Another Server: AT Server. Determines the behavior of the server when the procedure finishes executing. KEEP is the default value. For more information, see Keeping or Terminating the Server Session: KEEP/DROP. Enables you to receive parameters from the called procedure. For more information, see Passing Parameters Between Maintain Procedures: FROM...INTO and Passing Parameters Between Maintain and WebFOCUS Procedures: FROM…INTO. Enables you to pass parameters to the called procedure. For more information, see Passing Parameters Between Maintain Procedures: FROM...INTO and Passing Parameters Between Maintain and WebFOCUS Procedures: FROM…INTO. When issuing a CALL or EXEC statement, the optional PATH keyword is used to specify additional locations (search paths) the system should use when searching for dependent resources (Master files, imported modules, and so on). The path location names are application names existing within the APPROOT directory structure or application names that have been introduced with the APP MAP command. Open the deployment scenario editor. Right-click the server folder under Available Servers. Select Set Server Paths from the menu. The following dialog box appears. 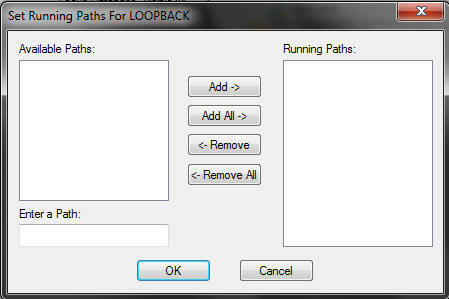 Items included in the Running Paths list appear as PATH values for those procedures that are invoked with the CALL or EXEC statements on the selected WebFOCUS Environment.